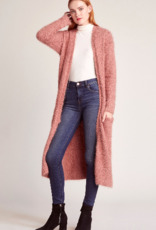 The Cardi B, not to be confused with Cardi A or C, is a soft, textured boucle cardigan that hits at the mid-calf. Fabric: Boucle. Fabric Content: 55% POLYESTER, 45% NYLON. Care Instructions: HAND WASH COLD SEPERATELY, DO NOT BLEACH.